The Buddha didn’t attain Buddhahood overnight. He cultivated for three great asamkhyeyas of eons before manifesting the Eight Signs of Attaining the Way. The first sign is the descent from the Tushita Heaven. The Tushita Heaven is where the Dharma Prince who will become the next Buddha dwells. The second sign is that of entering the womb. The third is that of dwelling in the womb. Even while in the womb, the Buddha turned the Dharma wheel and taught those beings with whom he had affinities. The fourth sign is that of birth. The Buddha was born on the eighth day of the fourth lunar month. After he came out of the womb, he pointed one hand towards the heavens and one hand towards the earth, and said, "In the heavens above and the earth below, I alone am honored." Was the Buddha being arrogant? I’m not acting like the Buddha’s defense attorney, but the answer is no, since the Buddha was indeed qualified to say that. He said it to let beings know who he was. We can say that the Buddha was the foremost practitioner of ascetism. For six years in the Himalayas, he cultivated vigorously while living on a daily fare of one sesame seed and one grain of wheat. He certainly didn’t take vitamin supplements. Later, he accepted a bowl of porridge with milk offered by a shepherdess. When he went to sit in meditation beneath the Bodhi tree, he made a vow: "I will not rise from here until I have attained Proper, Equal and Right Enlightenment." He sat there for forty-nine days, and then saw a star at midnight and awakened to the Way. He suddenly realized the original, pure, wonderfully bright, true mind which knows neither birth nor death, neither defilement nor purity, neither increase nor decrease. This is the age of the Dharma’s decline, and we must be true disciples of the Buddha. In the past, our forefather, the Buddha, did not take it easy in his cultivation. Even though we cannot live on one sesame seed and one grain of wheat a day, we should not crave good food either. We should not be greedy for vitamin supplements or rich food. The body is a stinking skin bag; it is only false combination of the four elements. We have been slaves to our bodies long enough; we have committed too many offenses on its behalf. If we still can’t see through the body and put it down, and we continue to slave and toil for it, we’re really wasting our time. Therefore, we should understand that life is full of suffering, and then we should study Buddhism in order to return to the source. Only by realizing sagehood and becoming a Buddha can we find true happiness. Today is the Buddha’s birthday, and we should learn to be like the Buddha. 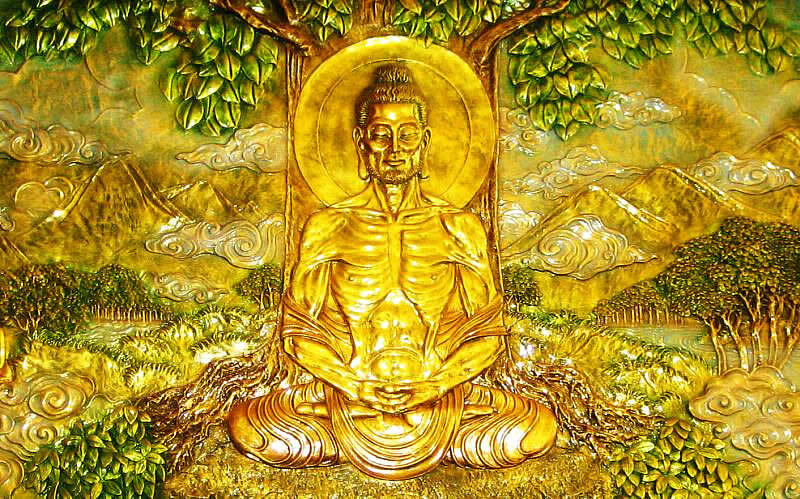 We should take the Buddha’s body as our own body, the Buddha’s conduct as our own conduct, the Buddha’s mind as our own mind, the Buddha’s vows as our own vows, and the Buddha’s will as our own will. We should bear the toil and hardship, and emulate the Buddha’s indomitable spirit. Anyone who can be this way has a chance to become a Buddha, and will quickly be able to end birth and death. In his quest for perfect wisdom, the Buddha dedicated his life to vigorous cultivation. How can we expect to achieve Buddhahood without exerting any effort at all? Having left the home-life, if we don’t cultivate seriously, how can we face Buddhas, Bodhisattvas, and our ancestors? If we are greedy and contentious, pursue fame and profit, and become more and more selfish, how can we face our parents and ancestors? We should be considerate towards others and not just care about ourselves. We must muster our spirits and cultivate. We can’t put it off until tomorrow, for who knows when the ghost of impermanence will arrive? When he comes, we may want to live for a few more days, but it won’t be possible. Don’t wait until you’re old to cultivate the Way. In this world, we are born and we die, and after dying we are born again. If we don’t live virtuously, we may be reborn as animals. Once we lose the human body, we may not recover it for ten thousand eons. Don’t fool yourself into thinking you don’t need to cultivate because the Buddha can help you attain Buddhahood. Take a lesson from Ananda: He was the Buddha’s cousin, but the Buddha couldn’t give him samadhi. He still had to diligently apply himself to his own cultivation. Since you’ve come to the City of Ten Thousand Buddhas, the place where Buddhas are selected, you must study diligently to pass the tests. If you fail to do so, it will be too late for regrets.